It’s the third week of January and New Years Resolutions are dropping like flies. The top two resolutions are to get inshape/lose weight/work out/eat better and to get organized. Here’s a way you can attempt to do BOTH. 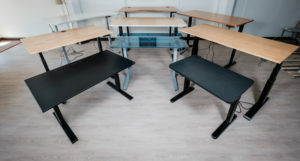 Using a standing desk, or a “stand-sit” desk, may have a myriad of potential benefits. 1. Using a Standing Desk May Lower Your Risk of Weight Gain and Obesity. The exact number seems to be a mystery but most articles estimate that standing burns 50-70 calories an hour more than sitting. How long are you at work? Do the math. Even a half day of standing is beneficial. 2. A Standing Desk Could Potentially Lower Blood Sugar Levels. A 2014 study put 23 overweight office workers through two five-day work weeks. In the first week, the participants sat eight hours each day. Next, they alternated 30 minutes sitting with 30 minutes standing. Glucose levels improved by 11%. This is especially beneficial to people with Type 2 Diabetes. 3. Using a Standing Desk May Reduce Your Risk of Heart Disease. As part of the Australian Diabetes, Obesity, and Lifestyle Study, researchers monitored the activity levels of roughly 700 adults to determine how much time these volunteers spent sitting, standing, walking slowly, and walking at a moderate to vigorous pace. Results confirmed that sitting worsens risk factors for heart disease. In conclusion, if you lower blood sugar and weight gain, a decrease in heart disease is a natural follower. 4. A Standing Desk Can Alleviate Back Pain. Let’s face it, a lot of employers will opt for the least expensive desk chair they can find. Furthermore, high quality desk chairs do NOT come cheaply. If you opt to stand, your body will self-adjust better than even the most expensive chair could. 5. Using a Standing Desk May Help Improve Mood and Energy Levels. A 2016 study involved 30 healthy adults who weren’t typically active during the day. In Phase One participants sat a full 6 hours. In Phase Two the participants exercised 30 minutes on a treadmill in the morning, before sitting for the rest of the day. For the Final Phase, participants sat most of the day but got up each hour for a short bout of activity, totaling 30 minutes of exercise throughout the day. Participants said they had more energy on the days they exercised and on the day they engaged in short bouts of activity throughout the day. Also, they reported better mood and lower levels of fatigue and food cravings at the end of Phase Three compared to the other two. In general, although both the morning exercise and short bouts of activity tended to boost energy levels and put people in a better mood, the effects of the morning exercises faded steadily over the day, whereas the effects of the short bouts of exercise lasted longer. 6. Productivity Could Be Boosted Using a Standing Desk. Ultimately, a healthy weight, lower blood sugar levels, and a reduced risk of heart disease will lead to a longer life. Read more about these benefits here. I’m no expert on standing desks. For this reason, I rely on my husband’s research who, along with the help of his father and brother, built a custom unit with this Uplift Desk, using two bases and an L-shaped top. In conclusion, if you’re considering a workplace change, read the above review and check with your HR department: you could get reimbursed for some or all of the purchase! Happy Standing!